Exposure: Filtered to full sun. Avoid intense afternoon sun. Flower Color: Each flower is an original and unique blend of cherry-red center, red veining and picotee edging on a white background. 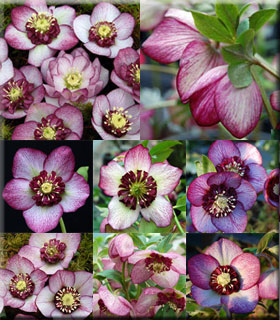 Comments: Winter Jewels™ hellebores are from a hand-selected seed strain, thus each plant produces a slightly different flower. Drought tolerant when established. Great winter interest. Deer resistant. Plant 18" to 20" apart.